The Process Engineering team at Tridiagonal is composed of a team of expert Chemical and Mechanical Engineers servicing the process industry segment over the last ten years in two key areas namely Process Development and Manufacturing. This team possesses a unique combination of skill sets such as Experimental Testing, Data Analysis, High Fidelity Process Modeling, Software Development, Design & Fabrication and Sensor Development. This blend of skill sets combined with expert problem solving capabilities is a unique strength that enables us to assist our customers from Concept to Practice. 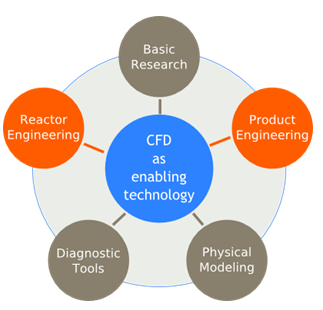 Traditional chemical engineering approaches to process development and solving manufacturing problems have relied extensively on lab and pilot scale experiments, plant observations and empirical correlations. This approach in our experience has been extremely time consuming and expensive and provides a very limited perspective on the cause and effect relationship. There is minimal opportunities to reduce trials and to get the design RIGHT THE FIRST TIME. With advancements in computer simulations and modeling techniques, it is now possible to couple experimental data and plant observations with high fidelity process models to gain deep insights into the process. 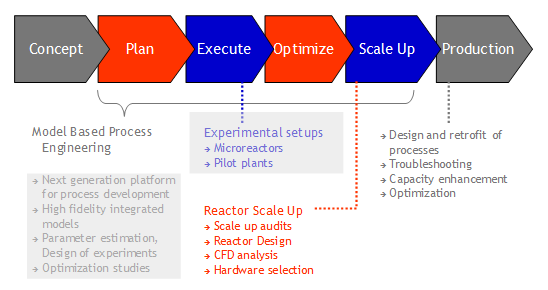 Our customers have realized significant benefits through our integrated approach to process design and problem solving. Experiments are still a critical element to process design.